The beauty of a Key West vacation is that disconnecting comes with the territory. With its position 150 miles from mainland Florida and at the southernmost point in the continental United States, Key West is the definition of disconnection. The pace slows down. You can truly relax and enjoy the beautiful surroundings whether it’s riding bikes through Old Town, sipping a mojito at Mallory Square or floating idly in a swimming pool. The island is home to some exceptional places to disconnect during your Key West vacation. We’ve compiled them for you here. 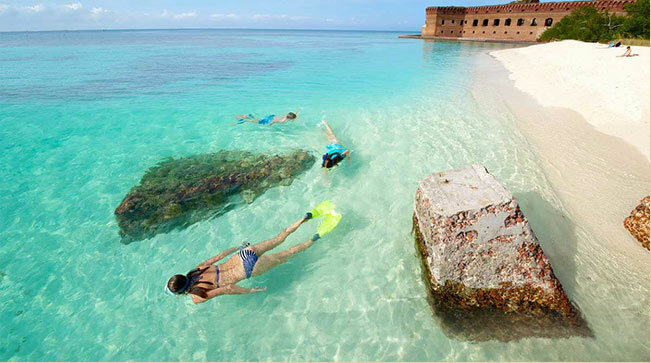 Found 70 miles west of Key West, the Dry Tortugas National Park is as remote as it gets. Once you’ve sailed through stunning aquamarine water and past uninhabited keys aboard the Yankee Freedom III, you’ll reach the Dry Tortugas National Park and its watery wonderland. It’s the ultimate daytrip experience from Key West where you’ll tour the historic Fort Jefferson, snorkel amidst sea turtles and learn about the site’s unique history. Overnight camping is also available and can be arranged through the Yankee Freedom III. Another offshore adventure can be found in the Gulf of Mexico’s shallow sand flats and mangrove islands. Woman Key is an incredible place to disconnect while relaxing on a sandbar beach or kayaking through mangrove islands and learning about Key West’s unique ecosystem. You’re likely to spot everything from dolphins and manatees to conch shells and mangrove crabs. It’s a relaxing way to commune with nature. Woman Key can be reached aboard Fury Water Adventures’ Island Adventure trip or Danger Charter’s half-day trip. For a shorter offshore journey, the Sand Key Lighthouse is seven miles due south of Key West. It’s one of the island’s most popular sites for snorkeling. Originally built in 1853, the cast iron screw piling of the light can be seen on the horizon on a clear day. It marks a portion of the Florida Straits reef, which is the third largest in the world. Companies like Fury Water Adventures embark on multiple daily trips to snorkel amongst this living barrier reef. It’s an otherworldly experience to view the life under the sea and one of the best ways to disconnect in Key West. Anglers love Key West for its bountiful fishing seasons and calm, flat water whether deep sea fishing or along the shallow flats. For deep sea fishing enthusiasts, the Gulf Stream is legendary. This is where anglers hook enormous pelagic fish like mahi-mahi and tuna. A fishing trip to the Gulf Stream is both peaceful and exciting. Many times, you’re the only boat in sight with nothing but the deep blue sea surrounding you. Of course, as soon as you get a fish on the line, the adrenaline starts pumping. Tucked away in Old Town off Elizabeth Street, Nancy Forrester’s Secret Garden is an oasis of lush, tropical palms, banyan trees and poincianas with macaws and parrots flapping their wings in the verdant foliage. Nancy is an environmental artist, sustainability activist and teacher. She’s nurtured this lovely garden so that she can share it with visitors daily from 10 a.m. to 3 p.m., making it a wonderful way to disconnect. There’s nothing like a day at the beach to disconnect and Fort Zachary Taylor Beach & State Park is the prettiest on the island. Whether it’s sunbathing on the rocky shore, snorkeling along the jetty, hiking through nature trails beneath Australian pine trees or touring the historic fort, there are so many ways to while away the day here. There’s also a snack bar and kiosk to rent beach chairs, kayaks and snorkel equipment.